Heat oven to 350°F. Spray 13x9-inch (3-quart) glass baking dish with cooking spray. In medium bowl, mix enchilada sauce, chiles, green onion whites and taco seasoning mix. Spread 1 cup of mixture in dish. Sprinkle with 1 cup of the Monterey Jack cheese. Top with chips. Drizzle with remaining sauce mixture. Sprinkle with remaining 1 cup Monterey Jack cheese. Cover with foil; bake 30 minutes. Remove foil; make 6 wells in chip mixture. Crack one egg into each well. Bake uncovered 15 to 20 minutes longer, or until egg yolks are set and whites are firm. Top with green onion greens, avocado and queso fresco cheese. Sprinkle with cilantro. Serve immediately. While we tested with Monterey Jack, pepper Jack, Cheddar or even mozzarella would work well in this recipe. If your casserole dish is a little shallow, consider spraying the foil before placing on top of the chip mixture to prevent the cheese from sticking to the foil. 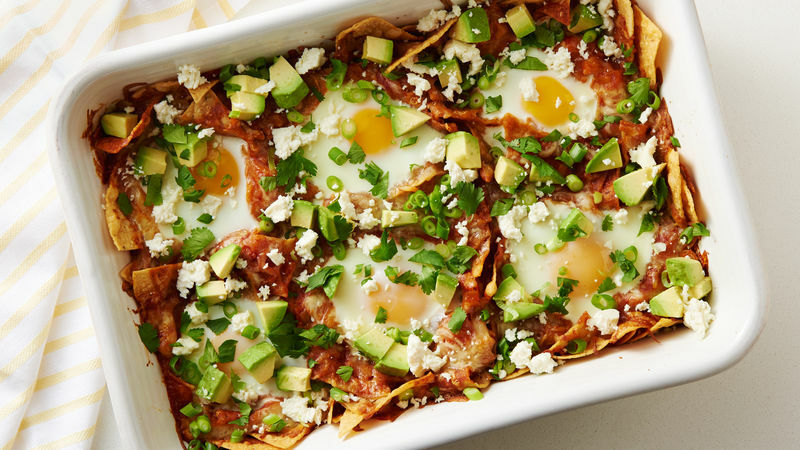 A drizzle of Mexican hot sauce or Sriracha adds a nice kick to this dish.